CoreLogic has added a new “pick” called Modular Homes to the Type of Dwelling field in Fusion. You will see it when you enter your Residential or Farm listing. This addition was made to differentiate modular homes from mobile homes. The field will not appear on our current listing form, but is visible in Fusion when you broker load your listing. For those of you searching for modular homes, you will be able to specify this in the Type field. 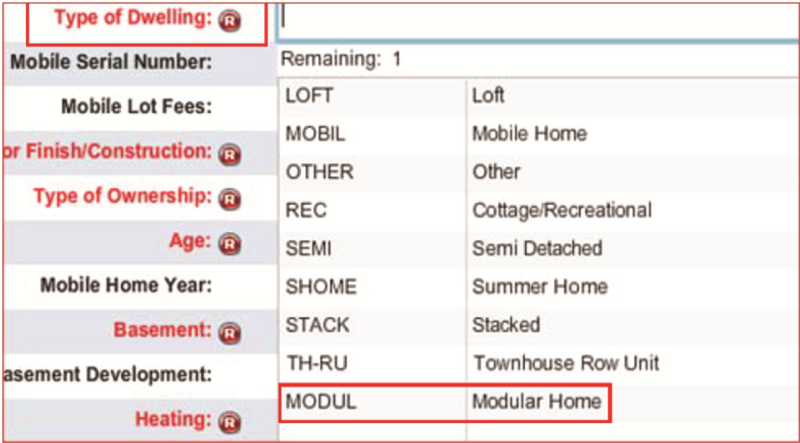 For those of you who have active listings that are Modular homes, please edit the Type to indicate Modular. If you have auto email set up for clients who are looking for Modular, be sure to edit the search parameters so that they receive this residential or farm house type in their notifications. Contact the MLS® department if you have any questions – 905.667.4650.